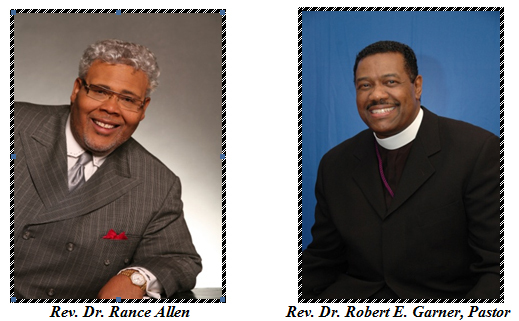 The Word of Truth Church of God in Christ, invites you to attend our 29th Founder’s Day Celebration honoring Dr. Robert E. Garner, Pastor/Founder, May 6, May 13, May 14 and May 16, 2011. Friday, May 6, 2011, 7:30 p.m.
Friday, May 13, 2011, 7:30 p.m.
Saturday, May 14, 2011, 11:00 a.m.
Sunday, May 15, 2011, 5:00 P.M.
Reverend Dr. Rance Allen and from the New Bethel Bountiful Blessing Church of God in Christ. Stats: 23 queries. 1.047 seconds. Valid XHTML, Valid CSS, XFN. "Red Delicious" theme by Nicki Faulk. Website by Palmerworks Design.